Official Hewlett Packard HP 48G Series User’s Guide. 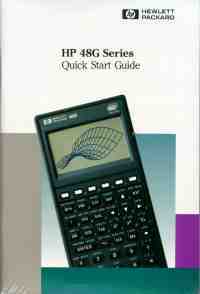 This is the manual set that comes with the now discontinued HP48G, HP48G+ and HP48GX calculators. If you have this calculator but don't have the manuals for it this will be very helpful. It is an invaluable reference source for beginners and advanced users alike. HP Part Number is 00048-90126.